- Gildan Dryblend® Adult 6.8 Ounce Piquè Sport Shirt. - 6.8 ounce, 50/50 Cotton/Poly preshrunk piquè. - Contoured welt collar and 3 color-matched button placket. - Transitioning to side seams in 2019. - Pad printed neck label and double satin shoulder label. - Transitioning to tear away label. 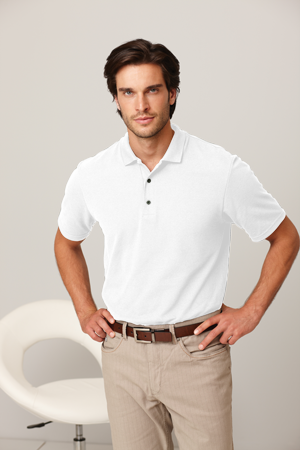 Gildan Dryblend® Adult 6.8 Ounce Piquè Sport Shirt. 6.8 ounce, 50/50 Cotton/Poly preshrunk piquè. Contoured welt collar and 3 color-matched button placket. Double needle sleeve and bottom hems. Quarter-turned body. Transitioning to side seams in 2019. Pad printed neck label and double satin shoulder label. Transitioning to tear away label. Sizes: S-3XL. Neutral: White. Colors: Black, Maroon, Red, Royal.